Acer products are built and tested to last, incorporating innovative features designed to withstand the wear and tear of everyday use. At Acer, we are so confident in the quality of our products that we’re proud to offer the Acer Reliability Promise on the whole professional product range. Challenge Acer business product for reliability. 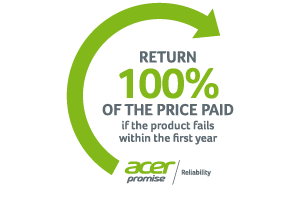 By purchasing a qualified Acer professional product until 31st of December 2019 and registering it within 30 days, will allow you now to claim 100% refund of the full price paid if your Acer device develops a fault and is repaired under warranty within the first year. Don't miss the valuable opportunity to protect the investment by purchasing an Acer professional product. Register your device to the Acer Reliabilty Promise. Purchase an Acer product that qualifies for this offer. Click here to view qualifying products. To register your purchase, visit the Website, click on the “ Register” link, and enter the requested information within 30 calendar days of purchase. The first day of purchase as detailed on your invoice or receipt counts as day 1. Should your new purchase develop a technical fault within one year of purchase, simply call our dedicated warranty number 0371 760 1000 to report your technical fault then follow the online Claim instructions to proceed with your claim. SIMPLE! Please contact our Customer Services Department with all queries relating to the promotion. Q. I have bought a product that isn’t on the list of qualifying products, can I still participate? Q. I have missed the window to register my product; can I do this after 30 days from my invoice date? Q. My Acer product has developed a technical fault, what do I do? Q. My qualifying Acer product has been repaired under warranty, how long do I have to complete my claim? Q. Once my claim has been approved, how quickly will I receive my refund? Q. How can I submit my proof of purchase receipt/invoice?